Make your Own Bagels? Yes You Can! * I use Organic All-Purpose Flour. If you can buy it in bulk at Costco your bagel cost is cut almost in Half! Either plop the dough on your counter and knead for ten minutes, until it is uniform and smooth, or put your dough hook attachment on your mixer and run for about 8 minutes. I’m lazy, I use my Kitchenaid stand mixer. * It works fantastic. This step is important! I’ve tried skimping on the kneading time and the bagel were flat with poor texture. * I’ve had my Kitchenaid stand mixer for ten years and it still runs like a champ. I highly recommend them. Cut the dough into 8 equal size balls, cover and set aside to rest in a warm place for 20 minutes. This part takes some practice, but you’ll get the hang of it…Take each of the dough balls and roll into a “snake” until it is longer than the width of your hand. Wrap the “snake” around your dominant hand, overlapping the ends. 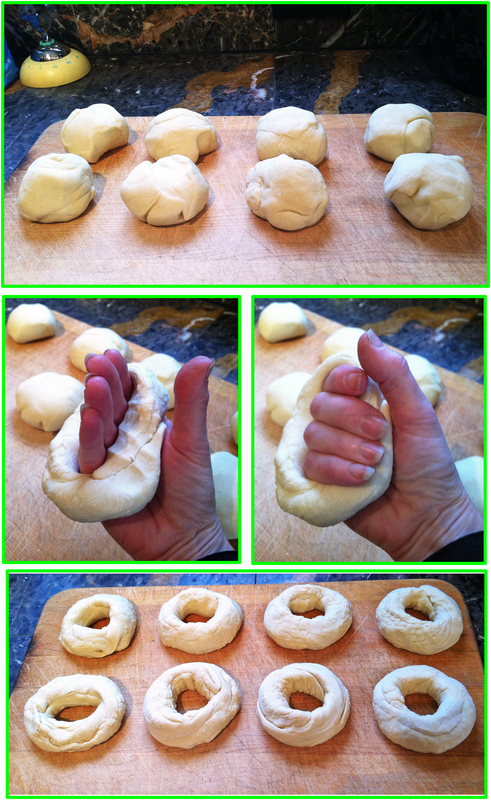 Now use your palm to squish/roll these two ends together until they fuse, and you’ll have a circular bagel-like shape. Cover and rest your bagels for another 20 minutes. While your bagels are resting, Preheat the oven to 425, get a large heavy pot of water boiling, rub a good splash of oil on a cookie sheet/baking tray, and get your favorite toppings ready. Use any toppings you like. My favorite is sort of an “everything bagel” mix of kosher salt, cracked pepper, garlic, poppy seeds and sunflower seeds. Note: if you use salt, always use kosher or “large grain” salt, and use it very sparingly! Let them dry for a minute, then dip them in your topping and place them on the baking tray. Bake for 10 minutes, flip them over and bake for 10 more minutes, and they are done! Let them cool for 20 minutes, then grab the cream cheese and dig in. There’s nothing nicer than a hot, fresh bagel. Enjoy! Note: Slice your leftover bagels in half and freeze. For in instant breakfast just pop in the toaster oven or toaster. Bagels also make great sandwiches. This entry was posted in food, lifestyle and tagged bagel recipe, bagels, baking, breakfast, brunch, cooking, fine dining, fine living, food, kitchenaid, lifestyle. Bookmark the permalink. Do you add the toppings before you boil them or after boiling but before broiling? Ooops. I see it, after boiling before heading to the oven. Thanks! Making these right now! Yay! Enjoy your bagels! Tell me how they come out and what toppings you use! Thanks so much, they were fantastic! I made half the batch into chocolate chip bagels using bittersweet Ghirardelli chips and the other half I used sesame seeds with a bit of onion and garlic powder. So good, although I have to say I probably should have made them all into choc. chip because the kiddos devoured those up. I’m so glad you all enjoyed them! My favorite are “everything” bagels. I usually make a double-batch and freeze the extras, though they are best fresh 😉 Bagel sandwiches are awesome, too.